Gentle Ways to Encourage Your Child to Eat – and Eat Healthy. Are you convinced your child will eat only pasta and chicken nuggets for the rest of her life? Worried your son is not getting adequate nutrition? Tired of vegetables being cast as the villain during mealtime battles? Nearly all parents experience a finicky eater at their table, but finding solutions can be difficult. 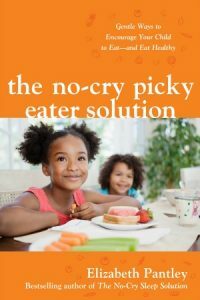 That’s why Elizabeth Pantley, author of the bestselling No-Cry series—the most trusted name in parenting guides—developed gentle, effective, and easy solutions for dealing with picky eaters. Armed with Elizabeth’s proven advice and these tasty recipes, you’ll be able to serve healthy meals and snacks, along with peace and happiness. With a Foreword by Missy Chase Lapine.